ASUS Philippines All-Out “Summer Sale Madness” Promo! Globe At Home entertainment to the Xtreme! 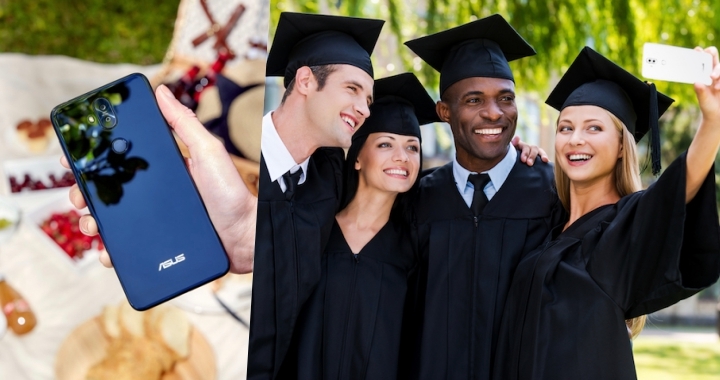 From wefies that shout ‘one last hurrah’ with all your mates, to perfectly instagrammable sceneries from your graduation-gift travels, you’d need that one mobile device that’s ready to capture these moments leading up to your biggest milestone to date. Graduation has always been one of the end-goals of any student who has invested much effort in their future. However, remember that the time between where you are now (after all that scholastic rollercoaster ride) and your long-awaited diploma, is a time you can fully enjoy on your own. Don’t waste it just by waiting for days to pass by! While there have been plenty of times you’ve surely been alone while still in school, this time of your life is the best time to actually spend on yourself and just be you. Watch a movie by yourself, attend some classes you’ve always been interested in, or even go to the outskirts of the metro and just take in the fresh air! And don’t be shy to appreciate yourself doing these things alone – take a selfie! PRO TIP: You don’t have to use a selfie stick as long as you have a camera with a lens wide enough to catch all the background while keeping you in the frame! Before you know it, it’ll just be a few more days before you’re out on your own, and people around the campus will seem less intimidating to approach – even those terror professors and mentors. Go on, invite them to lunches and dinners. These sort of things give you a better understanding of them and present you more humanized versions of them that you can easily turn to in the future. Plus, taking a selfie with them gives you the right to brag amongst your batchmates! PRO TIP: Use that beautification technology to look fresh if you’re taking a selfie after a few rounds of drinks and merriment! Aside from your usual group of friends, there are plenty of other people to meet and a whole lot of scenes to attend. Spend this time to put yourself out there – which is basically what life is all about once you graduate! You never know, you might just meet people who will be very important to you soon enough. Add them up on all of your socials and tag them in that wide wefie you posted, to officially cement your friendship for the long haul. PRO TIP: Get a phone with an ultra-wide angle front camera, so everyone’s the star in that photo! Before you take on the real world – as what they call life after college – take this time to travel. If not abroad, there’s still plenty of beauty to see locally, right? So pack what you need, get on a bus, and see the country. Traveling often grants you a sense of self; especially when you stand in front of the most breathtaking views. Don’t forget to take photos too. Take the widest and clearest photos you can, use them as your wallpapers or even print them out for decoration. Later on, you can look back at these photos for a quick getaway from times when you just can’t. PRO TIP: Photos are more jaw-dropping when taken in full view, so whip out that trusty quad-cam and take as many ultra-wide shots as you want! These are just some of the things you can choose to do. While they seem too care-free, it’s also in these experiences that you can find the help you might need in the aftermath of the graduation ceremony. With that said, it’s also equally as important to record these moments for the sake of remembrances. Consequently, it’s essential to find the right tool for all of the on-the-go activities you might want to keep pictures of. Luckily, you have the new ASUS ZenFone 5Q! Catching all of these moments is easy with the ZenFone 5Q! Dubbed as the smartphone with world’s first globally announced true quad-camera system, the ZenFone 5Q has a camera for catching every occasion in their perfection. It’s designed with a 20MP selfie and a 16MP rear primary shooters, great for taking snaps at any moment. With its secondary 120° wide-angle camera at both front and rear cameras, you’re also sure to catch the whole picture, whether it’s a full wefie or a wide landscape, without a hitch. The ZenFone 5Q is available nationwide just for the very affordable price of ₱16,995.00! You can also avail of this smartphone via Home Credit, with 0% interest for up to 6 months. For more information on ASUS, the ZenFone 5 Series, and other incredible products from ASUS, tune in to the ASUS Philippines Facebook Page and the ZenTalk Philippines Forum. Get the new ASUS ZenFone 5Q at the ASUS Online Concept Store in Lazada Philippines. Available in both Black and White color variants for only ₱16,995.00 and it comes with FREE SanDisk OTG 16GB. Take This Quiz: Which Powerhouse King is for You? Do you want to have your products to be reviewed by us? Any event launching or announcements to be featured here? Copyright © 2019 Good Guy Gadgets. All rights reserved.